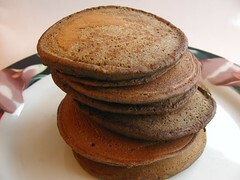 Down-Home Buckwheat Pancakes - Do You Know The Muffin Man? Notes: Blech, these tasted untasty. The Bob's flour is very dark, and turned out some angry looking pancakes. I like trying new grains and recipes, but 100% buckwheat may be too much for me, or I haven't found the right recipe. There is no sweetener in the ingredients, so eat these with plenty of applesauce or maple syrup. Mom said I should just think of them as healthy pancakes; I want to believe healthy and tasty aren't mutually exclusive!